Pardon me if you're feeling oversaturated with news of the wreck of the Costa Concordia off the coast of Giglio, Italy—and I do mean directly off the coast—but I'm endlessly enamored of ship wrecks. Plus I've just seen these images released by the Italian Border Police of the wreck and am astounded by how obviously, perilously close the captain took the boat to the shore—even if the channel had been free of obstruction and the ship was upright, there wouldn't have been enough clean water between the cruise liner and the shore for another similarly sized boat to make it through cleanly. Everyone's been focussing on the images showing the top and front of the ship. It makes a nice photo. (In fact, the far-overhead image with the coastline and the village roofs was the first of this set to catch my eye; the high-resolution shot showing the rock spur littered with cast-off life jackets is also unforgiving.) But it's the images of the hull that surprised me, making it obvious that the captain dragged bottom on the port side (which was away from the shore). 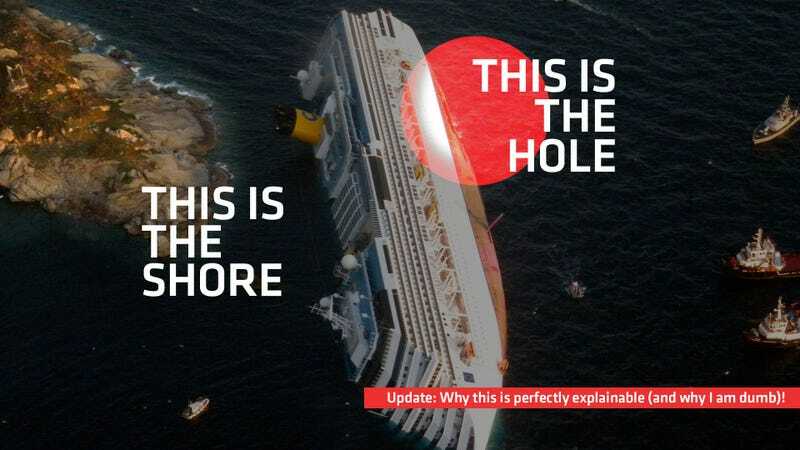 The ship wasn't taken out by the island itself, but instead was traveling between the coast and the obstacle which gouged the hole in the side. The picture isn't representative of what happened. The captain took the ship very close to the island, but at the time the port side of the ship was facing the island. It hit the rock, and kept going for a while. The captain then brought it around closer to a port, turned 180 degrees, and then the ship began to list and eventually was abandoned. This is where it is now. The location it is now wasn't where the accident happened. It's also worth noting that the ship is apparently being carried further out to sea at the moment, hindering further rescue or salvage operations for now.